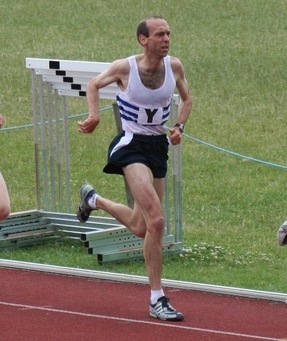 Ben Reynolds has won the World Masters Championships over 50 mens 5000m in Lyon, France today in 15.47.07. Ben has been a TAC member since he was at Sevenoaks School and has competed ever since, although is also a member of Thames Hare and Hounds. Ben reports that he managed to move away from the field with four laps to go, to win by ten seconds, despite temperatures being around forty degrees ! Good luck to the boys leaving for USA in August ! In August Ryan Driscoll and Luca Russo will be off to the USA to join San Francisco and Missouri Universities on track scholarships. Already based in the States are Robbie Farnham-Rose and Kieran Reilly. 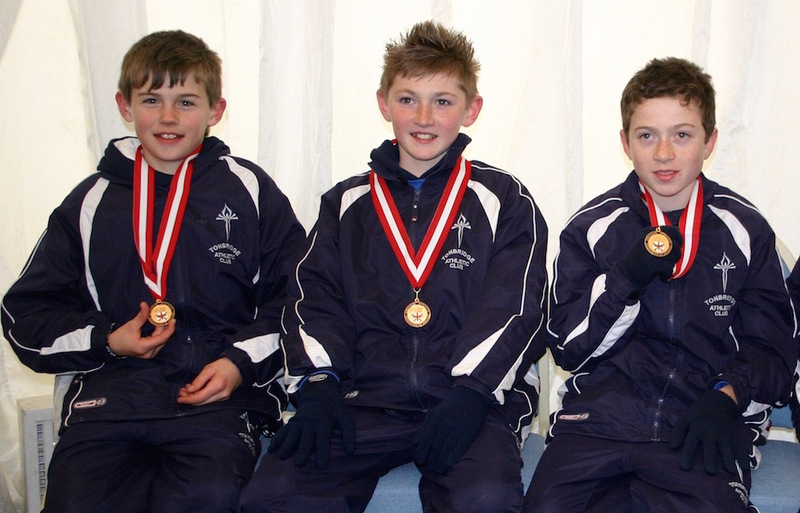 Luca, Ryan and Robbie have all been part of multiple TAC winning teams through the age groups. Below left is after the under 13 National Cross Country win in 2007 and right is after the under 20 win in 2014. You can see a photographic slideshow of their history with TAC under the Race Videos Summer 2015 pages. The meeting started with the 'traditional' strong wind, which died down as the evening went on. There were plenty of TAC athletes in action and it was good to see quite a few making debuts in the middle distance events. 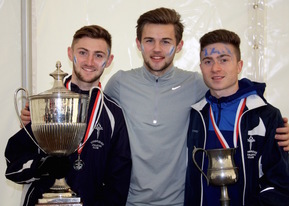 There were eight 800m races and four had TAC runners taking the win - Richard Bamford, Jack Keywood, Toby Emm and Jamie Bingham. Infact Jamie was back later to win a 1500m. 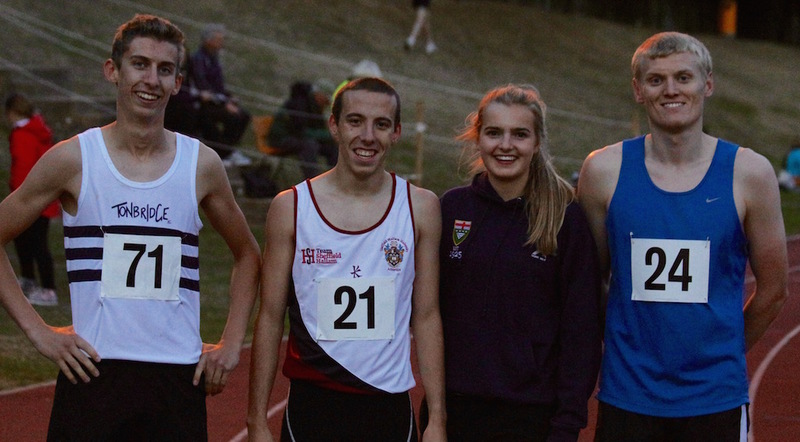 The biggest 800m personal bests were recorded by James Stoney 2.23.94 (16.0 seconds) and Matthew Randall 2.29.60 (14.7s), whilst at 1500m Maddy Wise ran 5.33.60 (15.6s improvement) and Kiri Marsh ran 5.10.52 (9.5s). Full results and a summary are on the Results 2015 page. 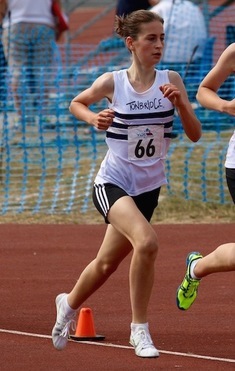 Kathleen Faes, despite being an under 15, raced in the senior England Championships, at Bedford, over 1500 metres. Kathleen ran 4.31.77 in her heat and qualified for the final as a fastest loser. With the final just over two hours later it was a tough challenge and she placed 11th in 4.38.98. Update from Mark Pitcairn-Knowles - Low turn out at Tunbridge Wells results in few changes to the top of the table apart from last years champion Dan Bradley taking 10 points to close in on the leaders , 12 points behind JT but only 3 scores recorded and sneaking past Cain by 1 point. Steve Keywood still sitting in a very strong position of 5th, 42 points, with only 2 scores recorded. 3 more qualifying events with the next this Saturday at Tonbridge. Tunbridge Wells - 1st Dan Bradley 16.40 (this was the nominated TAC Summer Grand Prix event. Tonbridge - 1st Stuart Brown 16.17, 2nd Julian Rendall 16.18. Steve Fennell started late and missed the start, but recorded 16.09 on his own watch. Polly Pitcairn-Knowles was the first lady home. Also Toby Ross completed his 50th parkrun and Dan Schofield was celebrating his birthday with a run. 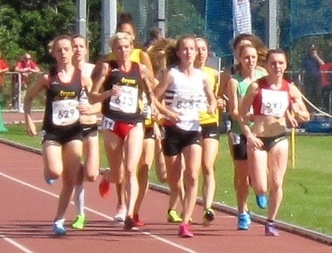 Fifteen TAC athletes toed the line at Watford and achieved 10 personal bests and three seasons bests between them. Over 1500m the fastest TAC athlete in action was Corey De'Ath (3.57.00), whilst there were personal bests for Alasdair Kinloch (4.01.10), Stuart Brown (4.09.97), Alex Hookway (4.10.74), Jordan Saul (4.22.59), Bede Pitcairn-Knowles (4.26.00) and Alice Wood (4.49.79). In the 3000m James West made a late decision to race, having felt unwell and ran a pb of 8.30.99. He was just ahead of Ben Cole (8.31.10), who ran a massive pb, whilst Tim Faes trimmed his own 8.40.37. In race 2, Michael Ellis set a pb of 9.21.58. 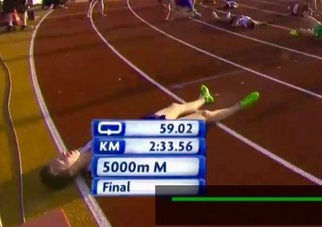 Miles Weatherseed made his international debut, competing for the England under 20 team, in the mile. He finished a close second in 4.19, in a tactical race, which saw him close with a 1.59 last 800m and a 55 second last lap. 'JT' is one of three to have completed 4 races and has set the initial target, although he can continue to improve on this if he betters any of his existing results. The latest table is below. There is a qualifying event at Tunbridge Wells this coming Saturday 1st August and also at Tonbridge on 8th August. TAC won this final match to clinch second place in the division and so gain promotion back to the top level. One of my highlights of the day was seeing Kiri Marsh and Holly Gordon, waiting at the finish with a few of the other 3000m runners, to greet the last runner home. This meant standing in the wet and cold for the best part of two minutes, so well done girls. In the under 20 mens age group there were A-string wins for Toby Ralph, who front ran 1.57.8 pb at 800m, Corey De'Ath (3000m) and Stuart Brown (2000m steeplechase in 6.32.6 (pb). The under 20 women's events saw wins for Hannah Czarnowski (800m in 2.22.7) plus Alice Wood (1500m in 4.56.1) and it was good to see these two racing so well. None of the under 17 men's distance runners claimed an A-string victory, but credit goes to Sam Crick for a 4.12.3 pb at 1500m, where he placed second. Alice Ralph (1500m in 4.52.6) claimed another victory in the u17s, whilst Polly Pitcairn-Knowles won the 1500m steeplechase in 5.34.4. Full results are on the Results 2015 page, with more details to follow. There were three TAC distance runners competing for the Kent under 13 team. Joe Pullman was 12th in the B-string 800m in 2.32.09. In the non scoring 800s Fraser Gordon ran 2.25.52 and Megan Moore 2.45.87. Fraser's was a pb by 5.9s, as he continues to be one of the most improved runners this year. Graeme Saker finished 25th overall in the race in 35.45, with Phil Coleman (37.38) and Cain Bradley (43.15) making up the winning men's over 50 team. 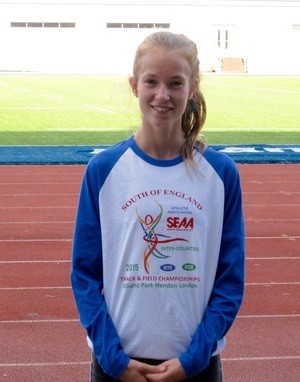 Lucy Pitcairn-Knowles was third over 50 lady in 44.54, with Maurice Marchant (49.55), the other TAC competitor. Dan Watt ran 33.56 to win this 10k road race, with Greg Cole in 5th in 34.57. 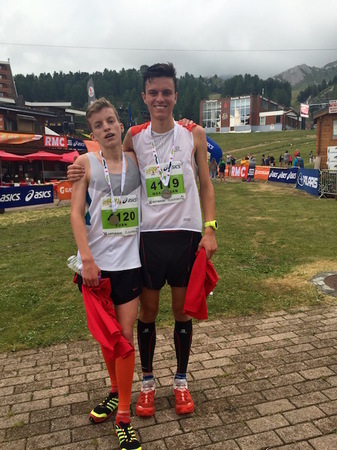 Max and Euan Nicholls raced up and down for 11km with 600m of climb in the ski resort of La Plagne. This was part of the 6D weekend running festival, the main race was 66km up to the glacier. Max won by 3 minutes in 55 mins with Euan really giving it all to come 4th overall and 2nd in his age category. 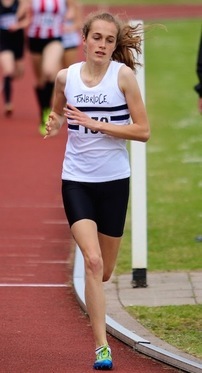 Kathleen Faes broke the TAC club under 15 girls 800 metres record with a 2.12.33 clocking. This removed 1.8 seconds from the previous time, set by Julie Adkin (Goodge) back in 1985. This was Kathleen's second club record within a few days, having set a 3000m mark last Saturday. Simon Fraser had started the TAC distance runners proceedings with an excellent 2.04.26 seasons best in the open 800 metres. This was Simon's best time for eight years, showing he is remotivated, as the M40 age group beckons in 2016. James West (u20) finished second in the British Milers Club 800m A-race, with a new pb of 1.50.81, to go second on this years TAC overall mens rankings. The other 800m pb came from Michael Ellis (u20) with 2.05.66. The only TAC athlete in the 1500m was Tim Faes, who took nine seconds from his best with a 4.03.57 pb. To finish off the night Nicole Taylor made her 5000m debut and ran an excellent 17.10.72 (also passing 3k in a seasons best. Hannah Czarnowski raced over 400m and found herself in the women's invitation race, where she finished 5th in a 61.51 pb. 400m Jamie Brown 53.11, 800m Ben Murphy 2.00.64, Dan Seagrove 2.03.83, 1500m Euan Nicholls 4.10.55, Polly Pitcairn-Knowles 4.59.64. These were all personal bests. 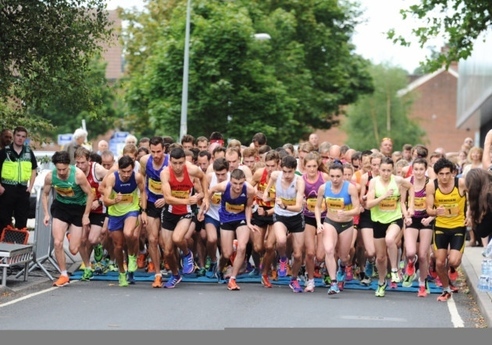 Marcin Urbanowsk, Dan Bradley and Dan Watt placed 1st, 2nd and 3rd in this 10km road race. Apparently, Marcin and Dan B arrived late, due to a mix up regarding the start time and Marcin started around 30 seconds behind the field. 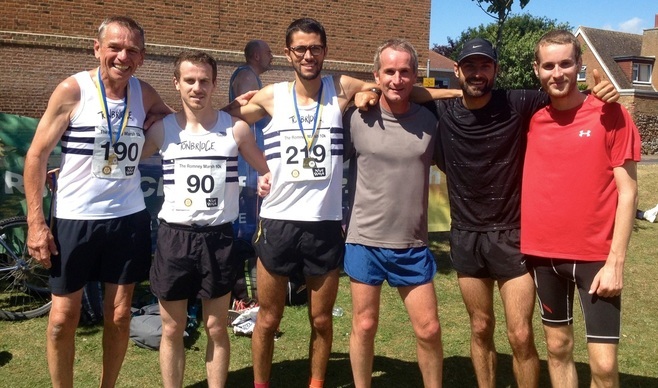 John Harley lowered his TAC over 60 age group, 10k road race record to 39.47 at Newham. John finished overall 152nd from a reported, 12000 entrants ! He was the first over 60 to finish. 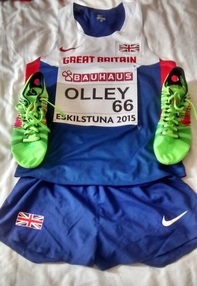 Chris Olley put in a brave effort to finish 11th of the 27 starters in the under 20 men's 5000 metres. In what turned out to be a very slow and tactical race (for them). Chris ran 14.51.22 and described the race as one of the toughest that he has ever raced. He has now completed his season and will have a rest, before building again for the Autumn. Below are the only photos that I have so far ! 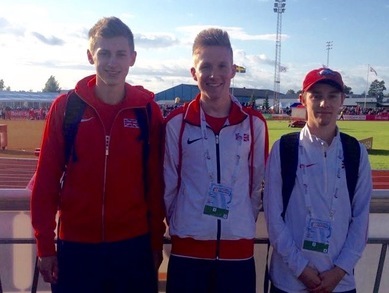 Chris (left) with Gus Cockle and Alex George (winner) his GB 5000m team mates.